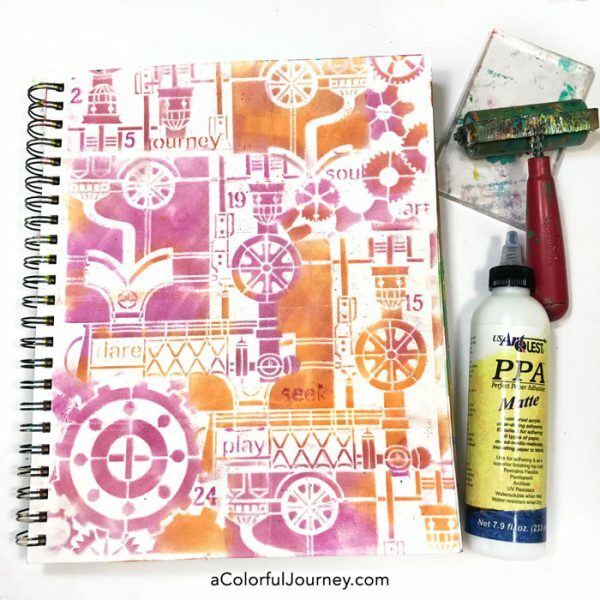 Building an art journal page with PanPastels is instant gratification. No pesky waiting for the color dry. But how do I seal PanPastels so they don’t smear and can pass a white glove test? One way is with a gel printing plate! In the video, you’ll see how I built this steampunk page by combining pieces and parts of several stencils from StencilGirl and then how to quickly seal them! 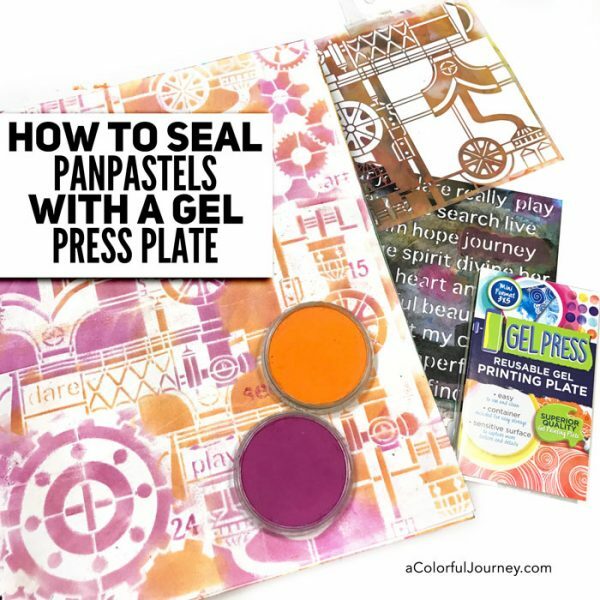 Watch How to stencil and seal PanPastels in an art journal on YouTube. I had the rainbow of PanPastels out for me to play with but only orange and magenta called to me today. Never fear the rest of the rainbow…I’ll use you next time! The steampunk vibe of the Gears and Machinations stencils called for words. Not just any words but words to fit the colorful factory found on the page. 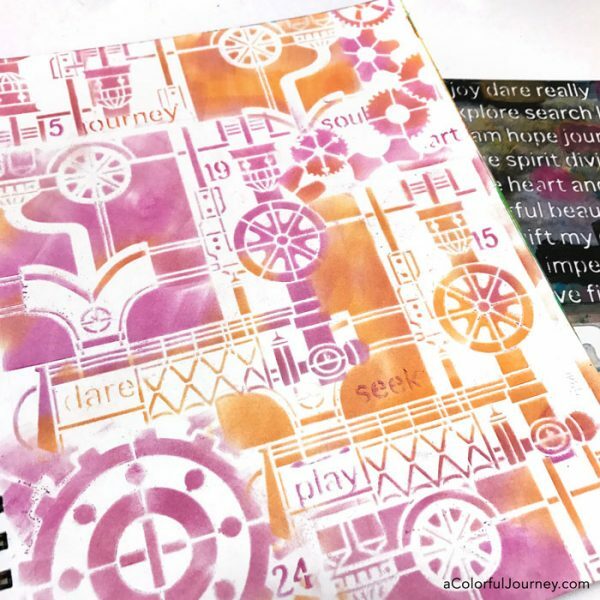 Adding text to my art journal pages lets me customize each and every page. Having a stencil loaded with a variety of words to choose from means I can find just the right words for each page. I used the 3×5 size of Gel Press Plate but you can use any size you have. This just happened to be the one closest to me at the moment. Why PPA matte by US ArtQuest? Because of how wonderfully matte it is and it is artist grade so it won’t yellow over time. Are you new to gel printing? You can see another way these mono printing plates can be used in this playful blog post. How cool! I’m going to have to get some PPA and try this! I have everything on the shopping list (or its equivalent here in the UK). I love the end result. Great piece of inspiration. I used stencils on a canvas and covered quite a large area with Pan Pastels. I didn’t seal them, but carefully painted over the design with acrylic paint. I think it was a lucky piece of work as I’m pleased with the result. Yes I did manage to rub off some of the chalky texture whilst painting, but it was a quick way to create a design. If I seal my next attempt, would I be able to paint over it, as that would save me having very colourful designs on the sleeves of my clothes !!!! !